Introducing DURAGADGET's new high-grade security device has been purpose built to provide you with peace of mind when protecting your laptop. Made from aircraft-grade galvanized steel, this lock is sturdy, strong, and extra resistant to theft. The rotatable sturdy locking mechanism (made from steel with an aluminium casing) fits into a 'Kensington port' and is looped around a secure/immovable object (i.e. table leg) to keep your Laptop safe. The mechanism features a 4 digit combination lock, giving you a high level of keyless security. Attached to the lock is a steel-stranded cable, providing extra resistance to cutting from objects such as bolt cutters. 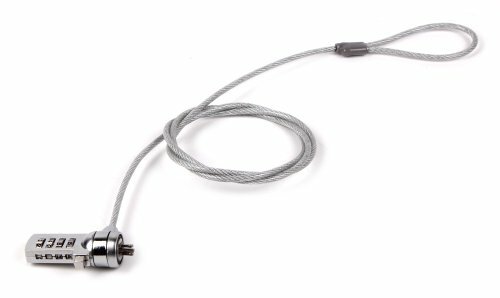 The cable has a simple loop in the end which the lock is passed through to complete the 'lock' once attached to a secure/immovable object. Compatible with: Alienware M11x 11.6", M14x 14.1", M15x 15", M17x R3 17.3" & M18x 18.4". If you have any questions about this product by DURAGADGET, contact us by completing and submitting the form below. If you are looking for a specif part number, please include it with your message.